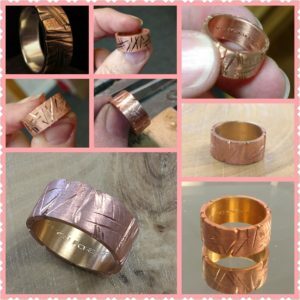 …my new FAVORITE FUN RING to make! Yep – I think I need to do more of these. Copper. Sterling. Gold. Time to PLAY! It was a simple idea. It was a simple copper crimp. It was simply awesome! My friend brought in a piece of copper crimping tube, given to her by someone special. It was 8mm wide, finger size 5, totally flat, slightly sharp in places – AND she brought in a really cool idea! She wanted to make the simple “ring” stunning and unique. Ok – I’m all over this! It started with a Sharpie – gotta love those. I put marks all over the tube where I knew I’d be using an 8.0 blade, a separating disc and a barrette file, finishing with a sanding stick. I never had to put this on a mandrel, the size would not change. This was simply hand and tool work. It was FAST! Copper is so soft, it was like butter with every cut and file. I found myself actually smiling as I was creating this awesome piece! I knew my friend wanted a bold look, not soft or frilly – something that had grit and shine without being sharp. Again, I’m all over this! I finished the inside with a satin look because we also added a special engraving; those words needed to shine! After I accomplished the carved look I knew my friend was looking for, I coated the entire outside and edges with hot pink nail polish! (That’s the “teaser” photo I sent her – and that’s when I knew she trusted me – heehee!) See, I had a plan to gold plate the inside so her finger didn’t turn green from the copper against her skin. I LOVE LOVE LOVE when people go “outside the box” and get creative with something special, from someone special, and entrust me to make it their DREAM. Even if it’s “just” a copper tube. PS If you have an idea, simple or complex, let’s play! You have a dream? I’m all over it. ← A little “Sparkle” for a Christmas bride!